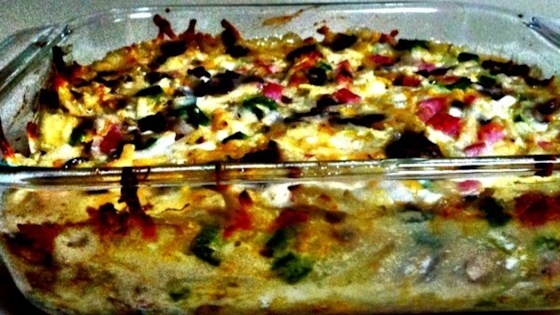 "Creamy, easy, and so very tasty, this casserole can be made ahead of time and can be changed depending on the cheese and veggies used. It's great for a brunch, lunch, or easy dinner and a great way to use up leftover ham." Preheat oven to 350 degrees F (175 degrees C). Grease a 3-quart baking dish. Heat olive oil in a large skillet over medium heat; cook and stir mushrooms, onion, and bell pepper in hot oil until onions are translucent, about 5 minutes. Transfer vegetables to a large bowl. Stir hash brown potatoes, ham, cream of chicken soup, sour cream, about 3/4 cup Cheddar cheese, and about 3/4 cup Parmesan cheese into vegetables. Spread potato mixture into the prepared baking dish. Sprinkle remaining 1/4 cup Cheddar cheese and 1/4 cup Parmesan cheese over potato mixture. Bake in the preheated oven until bubbly and cheese is melted, 40 to 45 minutes. Let stand for 5 minutes before serving. My daughter really liked it and she likes very little. Made it only once but the family loved it. Grandkids and adults loved. Even though the recipe makes a lot, it was gone in one meal.